The stained glass windows of Bapst Library's Gargan Hall are being fully restored for the first time in the building's 76-year history. The windows were designed by the artist Earl Sanborn in Gothic Revival style, and each section portrays an aspect of the University's curriculum of studies at the time of the building's construction. 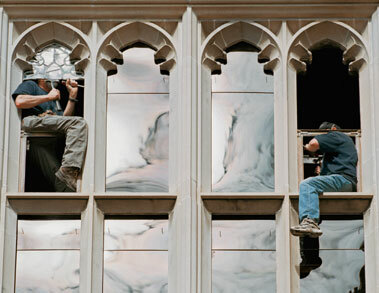 At left, technicians from Serpentino Stained and Leaded Glass remove the panes, which will be sent to the company's workshop in Needham, Massachusetts. The panes will be soaked overnight in a solution of hot water and soft soap, rubbed clean, and then reassembled in new fixtures. The restoration of half the windows, begun in June, will be finished in October. Work on the second half will start next summer.